For months I have been working on my new website but letting so many things get in the way. The biggest road block was not wanting to put it out there until it was "perfect" Perfect is a big word, and it certainly does not define any part of my life, especially my photography. Although I strive for getting the technical process down correctly I often leave the out come up to chance and embrace the imperfection. I believe you should know and practice the "rules" before you can break them or let them bend. With my portrait clients, I try not to coach them but let their personally come through and capture that moment, in documentary work, it is just that, documenting not orchestrating the moment, and my personal creative work is full of imperfection. So why then am I waiting on my site to be perfect? It's not going to happen, it will not ever be finished, it will always be in transition as I learn and improve and go into this beautifully creative life. So here we are, here is my first blog post on this site. I'll start with some true imperfection and share some of the Cyanotype project I have been working on. 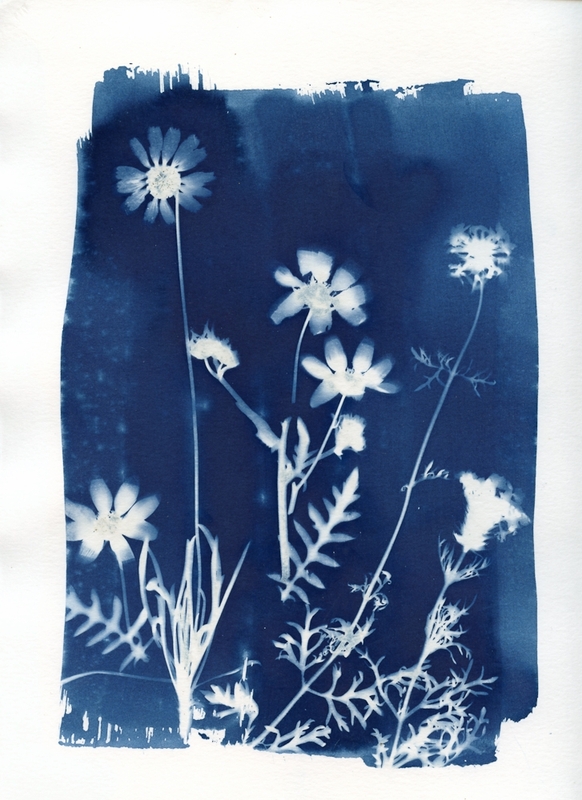 The Cyanotype was the first simple, non-silver iron process used to create a Photograph. Is often the first “alternative process” you might come across. The process uses two chemicals: ammonium iron(III) citrate and potassium ferricyanide. The English scientist and astronomer Sir John Herschel discovered the procedure in 1842. Anna Atkins created a series of cyanotype limited-edition books that documented ferns and other plant life from her extensive seaweed collection, placing specimens directly onto coated paper and allowing the action of light to create a silhouette effect. By using this photogram process, Anna Atkins is sometimes considered the first female photographer. I came to learn about Cyanotypes when I was to graciously pulled into a group of amazing artist known as Shootapalooza. (that story is for another day) Here are a few, I hope you enjoy the imperfect beauty. The month of May I exposed at least one cyanotype every day. Each day was different form the other, from different location, different sun conditions, different objects. Several days I faced heavy clouds and rain. Those days were often long, 24 hour exposure and often the paper would be prematurely soaked. Or the heavy clouds produced this lovely green color instead of the traditional blue. The soft blue, first one on row 2, I exposed while traveling out of town to help a friend. My husband pulled over on the side of the road, I picked a few wildflowers and exposed this piece through the windshield of the truck. This month is Cyanotype month, and World Wide Cyanotype Day is Sept 30. Here are a few links with information of how you can learn more and how to get started your self. http://bigbluecloth.com/ The World’s Largest CyanotypeA project I was invited to be part of. Also leave a comment and let me know if you are interested in attending a workshop. We hope to plan another one soon.